The Sèvres factory recruited its painters from many other professions: some began their working lives as fan painters, varnishers and even military engineers. Good eyesight was necessary for the detailed work involved and some began as young as ten years old, training first in monochrome and then graduating to polychrome. The Sèvres factory demanded complete loyalty from its workers. Its detailed records show that many became lifetime employees. From its inception, flower painting was part of the manufactory’s stock repertoire. In the 1740s, a newly hired fan painter was sent to Paris by the factory, then based at Vincennes, to study flower painting on Meissen porcelain. In addition to print sources, they must also have copied fresh flowers. Many of the factory painters were adept at working in a number of genres with flower painting being but one of their skills. 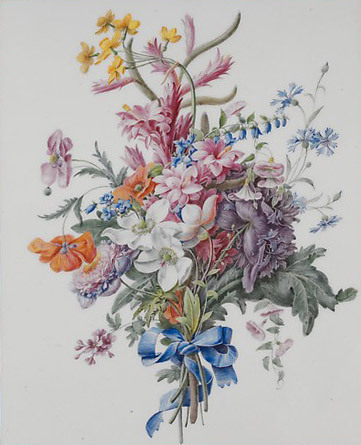 One of the most talented flower painters at Sèvres was Edme-François Bouillat père (active 1758–1800), who was responsible for the ribbontied bouquet on this rectangular plaque, a type frequently mounted on furniture made during Louis XVI’s reign. 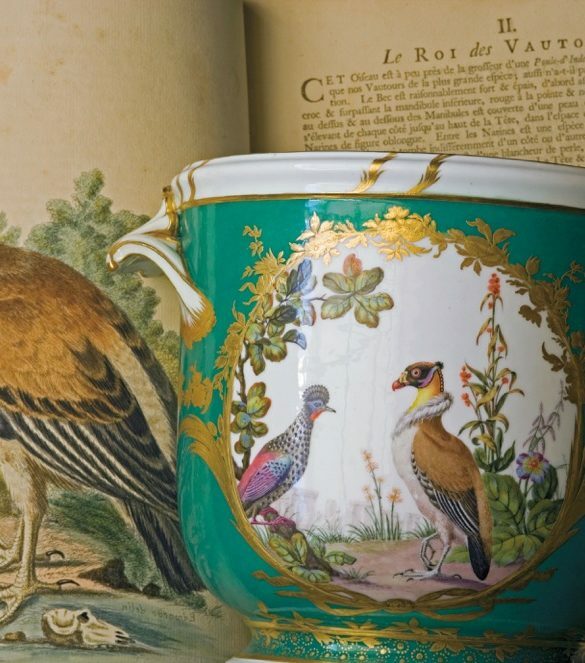 Most of the early birds painted on Vincennes and Sèvres porcelain were imaginary. One of the most celebrated naturalistic bird painters was François–Joseph Aloncle (1734–81), recognised for his work on a green–ground service made in 1766 for the 3rd Duke of Richmond, of Goodwood, West Sussex. In 1766, Aloncle visited the duke’s residence in Paris, the Hôtel de Brancas, to copy from George Edwards’ Histoire Naturelle de Divers Oiseaux (1745–8). The English print source was discovered during an FPS outing to Goodwood in 1988, when curator Mireille Jottrand observed Stonehenge in the background of the vulture painted on a seau à demi–bouteille (small wine bottle cooler) and this appears in an FPS monograph by Ghenete Zelleke, From Chantilly to Sèvres: French Porcelain and the Dukes of Richmond (Monograph VIII, 1992). Vulture (Great Bustard) with a view of Stonehenge on a seau à demi–bouteille (small wine bottle cooler), from a table service, Sèvres, 1765. Goodwood, West Sussex. 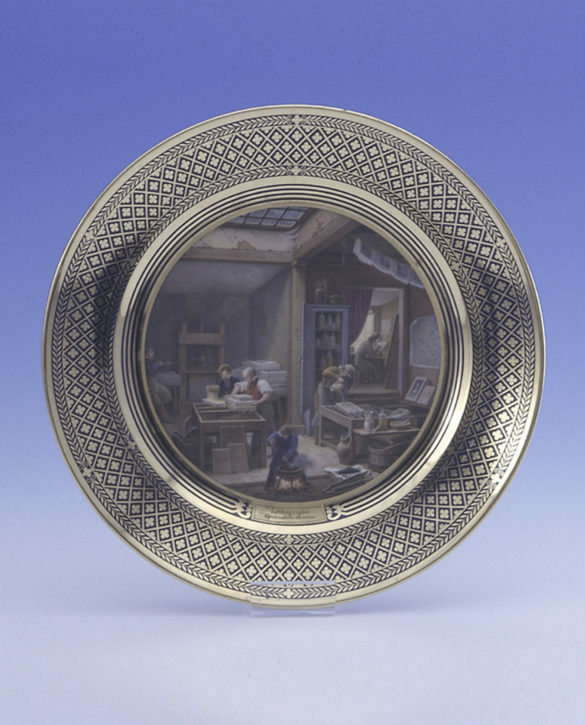 Depictions of everyday life were a frequent subject found on Sèvres porcelain; these are known as genre paintings. In the mid-eighteenth century there was a fashion for collecting the seventeenth-century paintings of peasants by the Flemish artist David Teniers (1610-90). Engravings after the paintings were widely circulated and copied by painters at Sèvres. Often the ceramic painters, such as André-Vincent Vielliard (1717-90), adapted the originals and placed the figures in landscapes rather than dark interiors. Vielliard was a former fan painter, who began working at Vincennes in 1752, and while not particularly talented he had a touchingly sweet style (see Juliet Carey, ‘Peasants on porcelain: Sèvres and the taste for Teniers’, FPS Journal, vol. III, 2007, pp. 111–30). 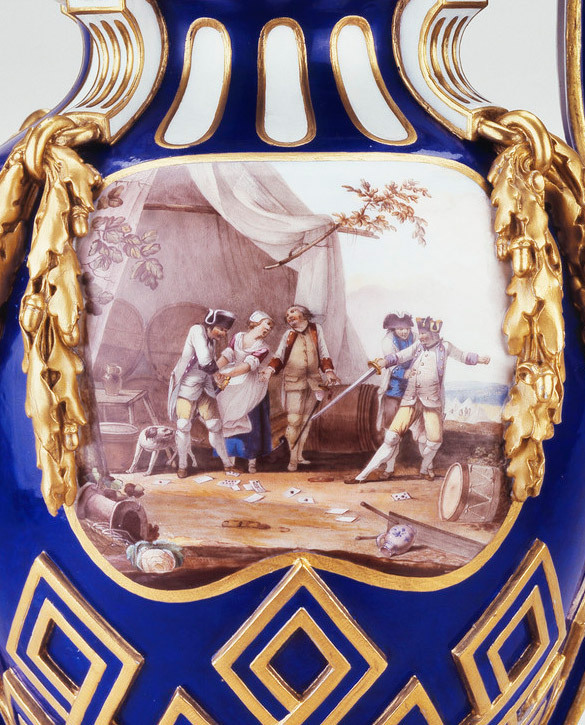 From 1759, during the Seven Years’ War (1756-63), military encampment scenes became a popular decorative theme on Sèvres vases. Among the painters who specialised in these military scenes was Jean-Louis Morin (active at the factory, 1754-87). Morin had first-hand knowledge of camp life when his father was an army surgeon and may well have sketched figures from life, paying close attention to the accuracy of the uniforms. He is best known for his harbour scenes in the manner of Claude–Joseph Vernet. The most talented painters at the manufactory worked in a variety of styles. Charles Nicolas Dodin (1734–1803) is best known for his paintings after Boucher and other French artists. However, between 1760 and 1763, Dodin worked in a distinct Chinese manner after Chinese woodcuts or even Chinese porcelain. 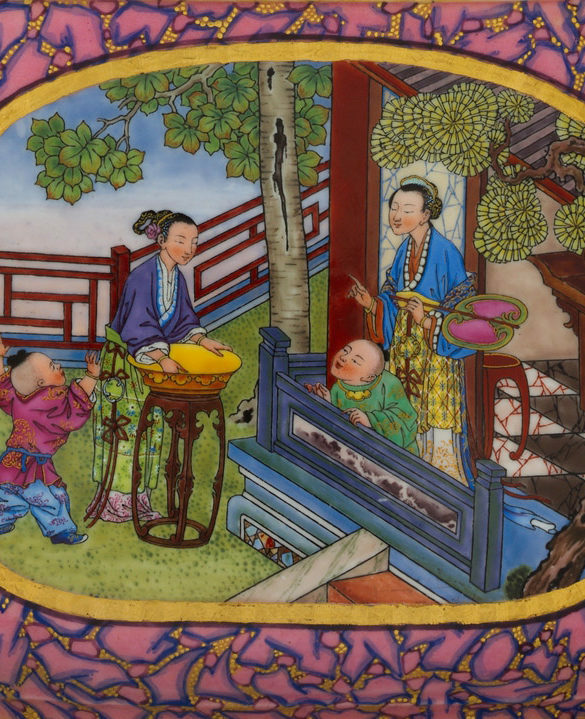 This style of European interpretation of Chinese and East Asian Art and Culture is termed ‘chinoiserie’. The marbling of the rose ground (rose marbré) was achieved by covering it with a blue enamel coating, which was then partially removed after it had dried, creating the desired effect. Then the purplish enamel was applied, followed by the gilded highlights. 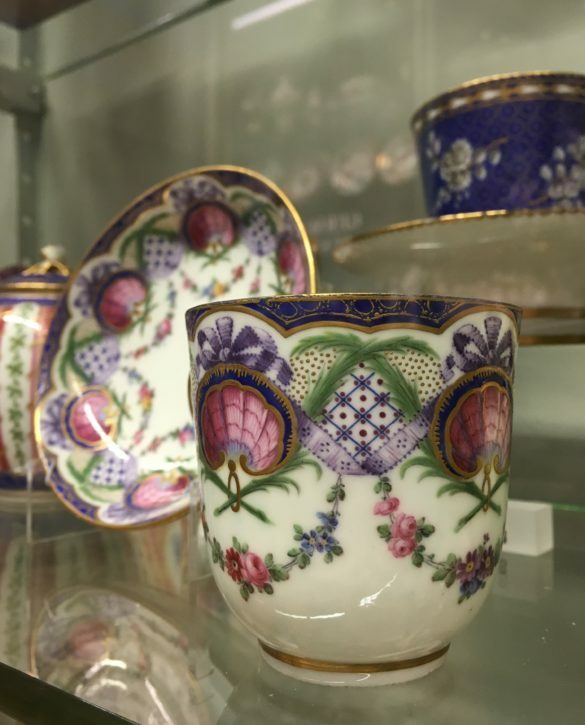 During the first Empire period (the first fifteen years of the nineteenth century) porcelain was sometimes painted to look like semi-precious stones. 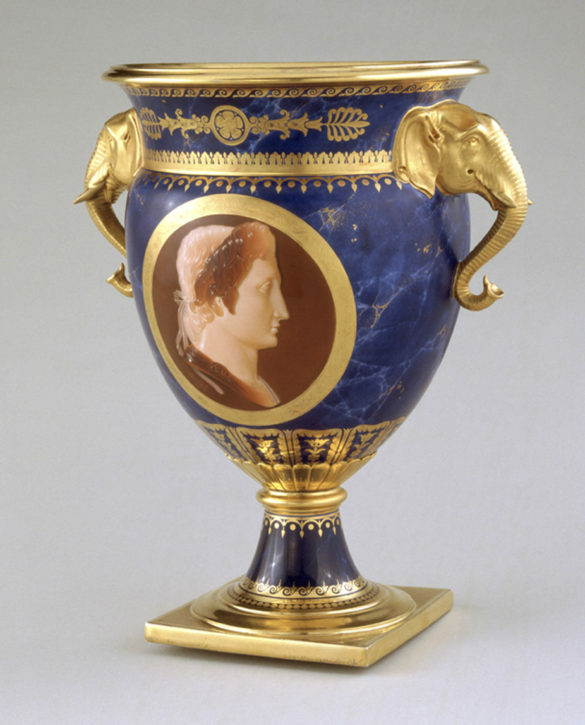 This ice-cream vase (vase glacière à gorge à tête d’éléphants) has an underglaze-blue ground veined in imitation of lapis lazuli, and is painted with a portrait of Alexander the Great in the manner of an antique agate cameo, taken from engravings in Ennio Visconti, Iconographie Ancienne ou receuil des portraits authentiques ….. (Paris, 1808). The other side bears a similar portrait of Julius Caesar. Jean-Marie Degault (at Sèvres 1807/8-17) was one of several painters to work on this service between 1812 and 1817. The service was a repeat of an earlier service iconographique delivered to Napoleon’s uncle, Cardinal Fesch, in 1811. Genre scenes and landscapes were widely used at Sèvres during the first half of the nineteenth century. One of the most productive practitioners was Jean-Charles Develly (1783-1862), who usually worked from his own gouache studies. Perhaps his greatest achievement was the service des arts industriels comprising 119 plates and 34 other pieces, later given to the Austrian statesman Prince Metternich. 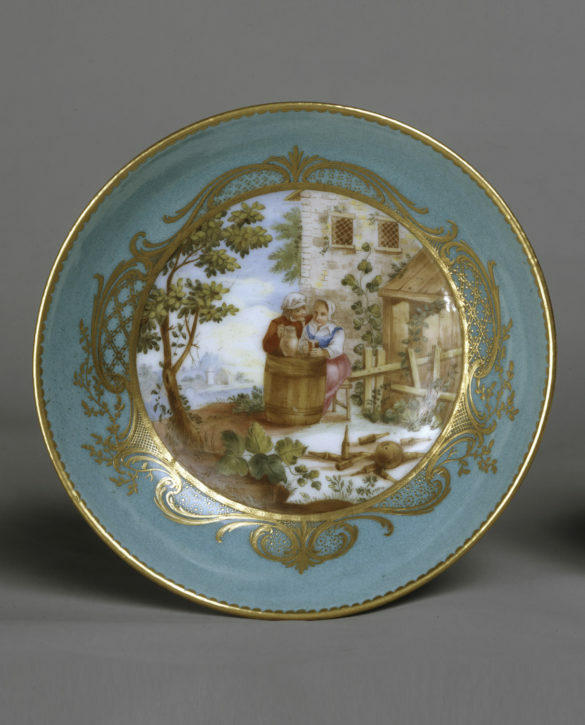 The plates are painted with contemporary scenes of crafts, trades and manufactures including the Sèvres factory itself. The elaborate gold border is transfer-printed.